It all started off with a simple trip to the combini…. So yeah, there’s still some tension in the air, but a fourth episode is a pretty good place change things up a bit. Now the over-arching mystery is still on-going, but they added way more to the mix that I would have thought going in. Magic-hamster? Did you see that one coming? I sure didn’t. But, I do wonder how much of it is a bit of smoke and mirrors on the high seas. So while the show may seem business as usual, it’s given us quite a bit to think about in the end. I kinda knew from the start that something would come up once they mentioned the big old sea mall. It wasn’t going to be a “there and back again” sorta trip. I was thinking a pirate element at first, or another attack from another ship, with Mashiro really having to try the captain’s hat on. But running into sympathetic members of the BluMers, and those that carried a certain degree of loyalty to the Munetani family is a good development. They sense it might be time to circle the wagons, so to speak. But I really liked the change of pace this episode. For one, it keeps the show from getting to, “attack of the week” and it goes toward building the necessary momentum to tie off some elements already introduced in the story. They don’t have to do that this episode, or the next couple for that matter. But some bits and pieces here and there do help toward making the overall plot more solid; or else to many dangling threads would distract. I like how they’ve built it up and gave it a rest here, as to much of one thing makes a story monotonous. For now, it does look like there might be a split in the power structure, like some of us suspected. Or as they state, a huge difference of opinion. The captain from the Surushima (the ship that mysteriously attacked our girls the first episode) is up and around but reports nothing amiss aboard her ship, leaving the counter-attack ordered by Akeno under a great deal of suspicion. So there is that dangling thread still going. But Mashiro’s sister brings up that the Harekaze is still in jeopardy before they reach home port. I wonder how much interference she can muster should things get really sticky. I’m almost sensing a “eye of the hurricane” moment for this episode as well. But for now, we have a magic-hamster. Good call on the writer’s part to make the quite one, Tama, become the victim of this. They can only take red glowing eyes so far. Good storytelling is working in contrast and assigning her the sort of crazy behavior she exhibited really made it count. If it were Mei, or one of the crew we’ve not spent a lot of time with, it might not have been as shocking. I think Brown Sugar would have reacted with just as much force as she did, and then as much remorse, had it been any of the crew, but that’s her odd character moment. But we’ve defiantly got something very very weird going on. Not to mention that the Musashi is still missing in the fog. Red Eyes at night, gunner’s delight? …an escaped rodent from Academy City’s science side? Why did the give us a specific shot of that USB stick? Oh, there has to be more on there!!!! Haifuri hasn’t failed to satisfy for the past month. I guess if you’re back reading this then you agree for the most part; having passed that silly three episode rule and all. I’m looking forward to seeing how they develop the plot from here. I think the hamster will play into it later on, but probably not as big and grand as we might suspect? For now there is just enough sinister stuff happening without taking weirdness into account. What did the Musashi find? Is it enough to earn all the tension the show has built up? Or it really evil hamster overlords? ..or is it her loony side story? I’m going to pass on “magic” and go with “some sort of bioweapon the emits pheremones or some other such thing that causes berserk paranoia.” Because that seems more believable than mind control. I’m not going to pass on magic quite yet, it’s still early days. But sure, whatever plot device works right? 2.) A Some sort of a Failed Academical Experiment (from the Blue Mermaid) so dangerous that needs to thrown away. Also It Not only apply to hamsters how about…Birds! Also Toilet Papers, Geez, I can’t believe that they are so devious on it…really! And yeah…I feel that big ship (Musashi), is going to wreck havok on them (harekaze)…so Buckle up people!!! 1) I’ve seen a few on other forums really try hard to link the Abyss marked box to the Abyssalls in KanColle. And by hard, it’s usually just cheerful insistence. 2) I do joke about how the hamster is escaped experiment from Academy City, or the hamster version of Academy City; like they have their own hamster Railgun? 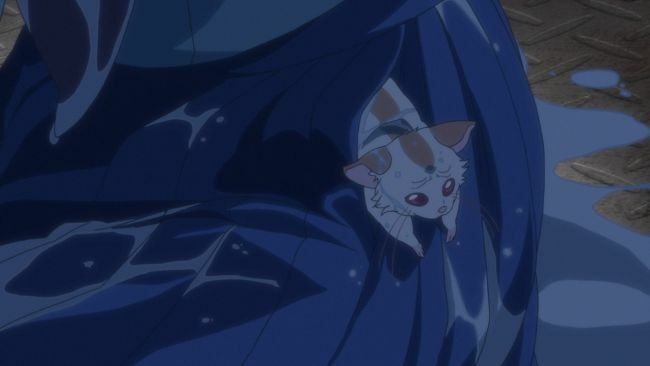 The only thing that punches a hole in that theory is that our little rodent seems to have a host of powers; mind control and some way to launch Tama out of the water; probably telekinesis but I’ll not lock it in. Espers from Academy City have on the one power. So yeah, that’s the only thing….the ONLY THING that keeps me from believing the hamster is from the hamster version of Academy City. If fishing for floating supplies is actually something that ships do regularly, putting mind-control hamsters into a box to be picked up wouldn’t be the worst thing you could do. Welcome to Wet Mart! Mind-Control Hamsters? Aisle 5, right next to pheromone-snails. Rats and other vermin have since centuries gone by, been one of the most frequent carriers of disease known to man. But what kind of disease is this that seems more like mind control than anything else? Are these mutant rats? Alien rats?! Sometimes this series is just a little too cutesy for me, and I have to gag at all it’s saccharine traditional girly escapades, but somehow I still do still stop to watch it every week. It’s not my favorite, but I’ll watch it anyway. The mixing of the cutesy, silly, and still having a serious plot is the niche that this show is creating for itself.